We met Pastor George McOmwanda when he was studying in Scotland in 1994. We continued the link when he returned and in 2002 began support for a water project for the deprived Asembo Bay area (see Past Projects). The same year we began support for Village Agricultural Development with a group called Jira Fids led by Alloys in Ukwala. This has involved establishing two posho (maize) mills and the construction of chicken coops for a poultry project, as well as support for the wider aims of the group to improve yields and develop techniques. We continue to visit the area and make regular small grants to support this excellent endeavour. In Kisumu, the Kaloleni PEFA church facilitated the formation of a micro-finance Revolving Fund (called the ‘Shiners’) in 2006. This has organised contributing members into groups (based on the Grameen principle) and made loans to help develop small businesses. These would normally find funding virtually impossible to access. 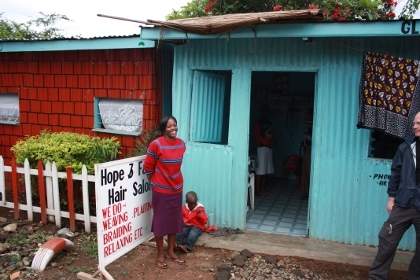 We have supported this by several grants of approximately £4000 total and despite setbacks due to the 2007 election riots, have seen encouraging evidence of members businesses developing (eg a man who had a barrow selling electrical items, was able to acquire a wooden duka (small shop) and then become a wholesaler). We ask for reports on the loan and repayment plan and are continuing our commitment to this project. Currently this group is considering joining a national SACCO funding scheme run by the PEFA churches.